As noted in Chapter 2, our Science Literacy Leadership Institute (SLLI) was not deliberately designed to produce teacher-consultants. It nevertheless served as a good starting point for science teachers who might be interested in pursuing other opportunities to complete the teacher-consultant credential. It also provided insights into how to design the Civics Literacy Leadership Institute (CLLI). We were able to use certain takeaways from the SLLI in designing the CLLI. For example, the facilitators of the SLLI realized that while participants had gained sufficient experience in Sharing Teaching Practice, one of three micro-credentials or “badges” required to become a teacher-consultant (see Chapter 5), they had only partial experience in both Researching Pedagogy and Writing in Community, leaving gaps to fill in those two areas. With that in mind, we decided that the CLLI should be designed so that participants would fully complete two micro-credentials and leave one to be pursued later. 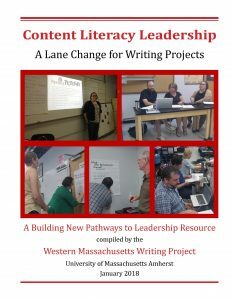 The resulting design had participants completing the research and sharing practice components, with the writing component to be completed through other WMWP programs offered for this purpose.